High winds forced a trash fire out of control, burning thirty square blocks, including most of the business district, the afternoon of June 25, 1918. 1,500 homeless people took shelter in the school (left center) and the Independent Mine Building (see photograph titled "Independent Mine, Cle Elum".) Most of the brick buildings in Cle Elum's downtown were built after the fire.Postcard titled: "The Burning of Cle-Elum." 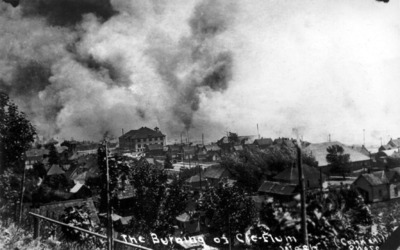 Connell, Russell H., "Cle Elum fire, June 25, 1918" (1918). Ellensburg History Photographs. 253.